Any other local terms for these out there? What do they use in Bolivia for example? So Hondurans are not only on strike to bring down the coup, but they've ramped it up with a blockade of Tegucigalpa. It's crazy inspiring. Check out the great coverage by narconews here and here. 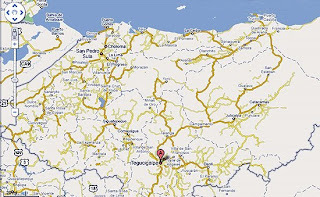 As Al Giordiano points out, there are only four routes in and out of Tegucigalpa. According to today's wikipedia, A blockade is an effort to cut off the communications of a particular area by force. It is distinct from a siegein that a blockade is usually directed at an entire country or region, rather than a fortress or city. Also, a blockade historically took place at sea, with the blockading power seeking to cut off all maritime transport from and to the blockaded country. Stopping all land transport to and from an area may also be considered a blockade. Blockades are often partial, with the object of denying the other side its major form of communication or access to key resources. And wiki says that A barricade is any object or structure that creates a barrier or obstacle to control, block passage or force the flow of traffic in the desired direction. Adopted as a military term, a barricade denotes any improvised field fortification, most notably on the city streets during urban warfare. Barricades featured heavily in the various European revolutions of the late 18th to early 20th centuries. The very first barricades in the streets of Paris, a feature of the French Revolution and urban rebellions ever since, went up on the Day of the Barricades, 12 May 1588, when an organized rebellion of Parisians forced Henri III from Paris, leaving it in the hands of the Catholic League. Wagons, timbers and hogsheads (barriques) were chained together to impede the movements of Swiss Guards and other forces loyal to the king. ... A major aim of Haussmann's renovation of Paris under Napoléon III was to eliminate the potential of citizens to build barricades by widening streets into avenues too wide for barricades to block. Such terms as "go to the barricades" or "standing at the barricades" are used in various languages, especially in rousing songs of various radical movements, as metaphors for starting and participating in a revolution or civil war, even when no physical barricades are used. the English wiki entry says nothing about the recent use of barricades in Oaxaca, Argentina, Bolivia, Peru or, now, Honduras. Anyone want to work on that? Una barricada es un parapeto improvisado que se hace con barricas, carruajes volcados, palos, piedras, etc. Sirve para estorbar el paso al enemigo y es de más uso en las revueltas populares que en el arte militar. Despues habla de su uso en Francia y España. Thanks to my friend Jill for the Mexico terminology. If you haven't seen her movie Un Poquito de Tanta Verdad - do! It has great footage of the barricades in Oaxaca, and check out the fab “son de la barricada” in the soundrack. Oh, and piquete - well, it's complicated because it refers to both a tactic and a particular movement. I'll make it a separate entry, soon. Sara, good post. I couldn't resist this response. Piquete is the actual event of blocking a road, piquetero is the organized unemployed worker who forms part of el movimiento piquetero, or una organización piquetera. pulga: (Spanish for flea) Simultaneous, numerous, and decentralized quick "hit and run"-style road blockades, often erected under cover of night that partly serve to disperse repressive forces. sikititi: (fire ant) marches of people, often in lines like ants. Bloqueo tactics in these cases can include the carpeting of a road with large rocks with protestors present or not. This ties up security forces forcing them to take the time to remove all the rocks for transit (in El Alto this included military vehicles). In other instances, full-on barricades were used, including train cabooses that were pushed off overpasses. Overpasses themselves were torn down with brute force to also create impromptu barricades on the main highway connecting La Paz to the rest of the altiplano. I write in the past tense because this is all mostly in reference to the Aymara-led uprising of El Alto in October 2003 to overthrow President Sánchez de Lozada, who by the way lives comfortably in a Maryland suburb despite the blood on his hands. Hi, just been pointed at your blog recently and I'm really in admiration of what you're doing - very useful! In Bolivia I have mostly heard 'bloqueo'/'bloquear' although the Aymara terms listed above are fascinating. One also hears exhortations to 'sow the road with stones'.